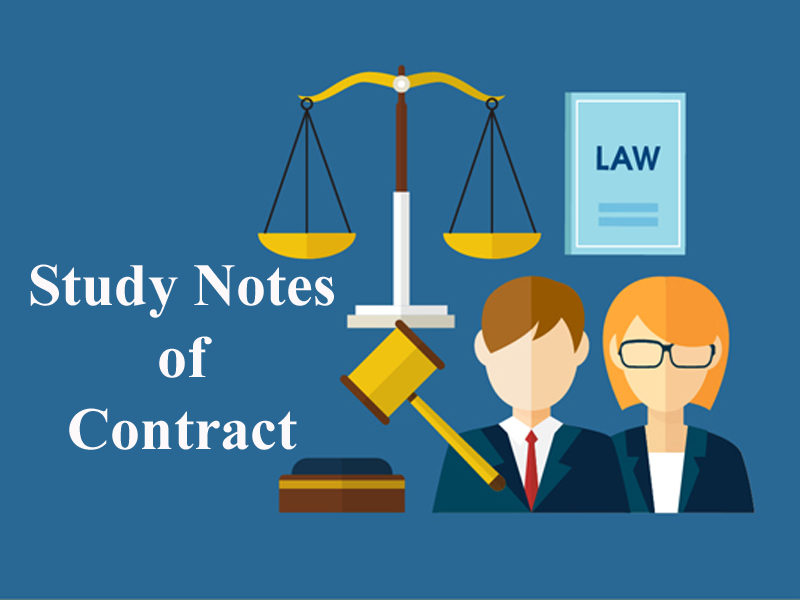 Here we are providing you updated and most relevant Study notes on Contract of Introduction and Basic Concepts for Law Entrance Exam. These study notes are highly recommendable for all those who aspire to crack CLAT, DULLB, AILET and other Law Entrance Exam. The Indian Contract Act, 1872 came into force on 1st September 1872. It extends to the whole of India except the state of Jammu & Kashmir. It provides a legal framework for not only the trade and commercial activities in which contracts are involved but also for social and familial contracts. A contract binds both the parties by the words written/agreed by the parties. The originally executed act has 266 sections later in 1932, section 239 to section 266 relating to partnership and in year 1930, section 76 to section 123 relating to sales of goods act were repealed. Note -1. The sales of goods Act, 1930. The Indian Partnership Act, 1932. Broadly, we can divide Indian Contract Act in two Parts as shown in Diagram. There must be a ‘lawful offer’ and a ‘lawful acceptance’. In other words there are some legal rules governing offer and acceptance. Both the parties, to a contract, must contemplate legal consequences. For example, a husband offering to take his wife out for a movie is not an agreement intended to create legal relations. Consideration is the price paid for the promise of the other. Consideration may be an act / abstinence or a promise. It may be past, present or future. • The parties must not be disqualified from contracting by law. • The Act lays down that the object for which the agreement has been entered into must not be fraudulent / illegal / immoral or opposed to public policy. i. It must be clearly understood that contracts need not necessarily be in writing. However, Indian Contract Act lays down that in certain special cases, for a contract to be valid, it must only be in writing. Besides, it also needs to be registered. An agreement for a sale of immovable property must be in writing and registered. To ensure that a contract is valid, the terms of it must be certain. In other words “agreements, the meaning of which is not certain or capable of being made certain are void”. For example, Mr. Sharma agrees to sell his car to Mr. Mukesh at “best competitive price”, since the price is not clearly ascertainable in this case, the agreement is void. The Contract Act lays down that “Agreement to do an impossible act is void”. Nagabushan agrees to bring a dead body alive in return for a crore of rupees. The agreement is not enforceable. • Agreement in absolute restraint of legal proceedings. Thus, an agreement should not be expressly declared void by the Act. • A valid contract gives rise to rights and duties. It is a contract, which satisfies all the essential elements prescribed by law. It is enforceable by both the parties. Note: A detailed description of all the essential elements of a valid contract is presented below. It is an agreement; where in any of the essential elements of a valid contract is missing. It is an agreement, where in free and voluntary consent of one of the parties is missing and hence the party whose consent is not free can avoid the contract. 11. The Contract of Pledge is contained under which Sections of the Indian Contract Act, 1872? 12. The Sections of the Act dealing with agency are? 13. Sec. 124-125 of the Act deals with? 14. Bailment has been dealt with in which Sec. of the Act? 15. Which Sec is the Interpretation clause of the Indian Contract Act, 1872? Get the updated and most relevant study notes on Contract of Introduction and Basic Concepts for upcoming CLAT and other Law Entrance Examination.